I’m not exactly sure why, but until a few days ago, I have struggled in recent months to want to cook anything new. With no headspace for it, I’ve been in a season of sticking to: old faithful recipes, porridge and weetbix and making one thing last a few nights. But my drought seems to have broken. Perhaps it’s because the weather has turned warmer, or because the kids are on school holidays, but today I tried this blog-worthy recipe, adapted from Jamie Oliver’s Ministry of Food via my friend Kara. It’s all the things this blog is about: not foody-ness – but taste, ease and affordability so that having people over isn’t too stressful. And what a terrific recipe this turned out to be! It can be made ahead of time, or in that last hour between getting home from work and people turning up – because once everything’s in the pot, it’s a simple case of simmering this gluten free meal while doing other things. Depending on the type and price of the chicken you use, this dish will cost between $10-$13 to make and serves 6-8 with rice. Add to this dollops of greek style yoghurt and fresh coriander leaves. I’m loving eating it, even as I type! Thanks for pointing me towards this bonza recipe, Kara. 1. Put the oil in the pan to heat and add onions, ginger and coriander stalks. Stir constantly for ten minutes to ensure it’s become fragrant and hasn’t burnt on the bottom. If using chicken thighs, throw them in for browning now, otherwise if using breasts, hold off til end of step 2. 2. 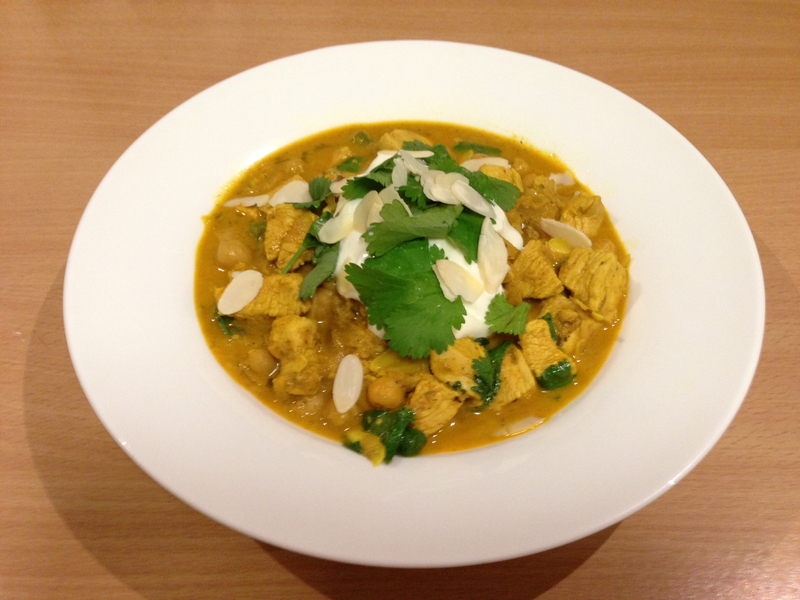 Add the korma paste, coconut milk, half the flaked almonds, chickpeas, desiccated coconut and sliced chicken breasts. Half fill the empty coconut milk tin with water, pour it into the pan, and stir. Let the whole thing simmer away for about half an hour. This is so easy – now just walk away and do other things, like putting the rice on in the rice cooker. 3. Season carefully once the chicken is cooked and become tender. Serve with boiled rice, adding a few spoonfuls of Greek yoghurt dolloped on top. Sprinkle over the rest of the flaked almonds and coriander leaves. Megan made this for me and the kids. Delicious!! Going to try it this week. I multiplied this by five recently to feed 30 people at a university ministry weekend away. I had two big stockpots going on top of the stove, stir-fried some vegies while the curry simmered and had borrowed some seriously big rice cookers from friends. 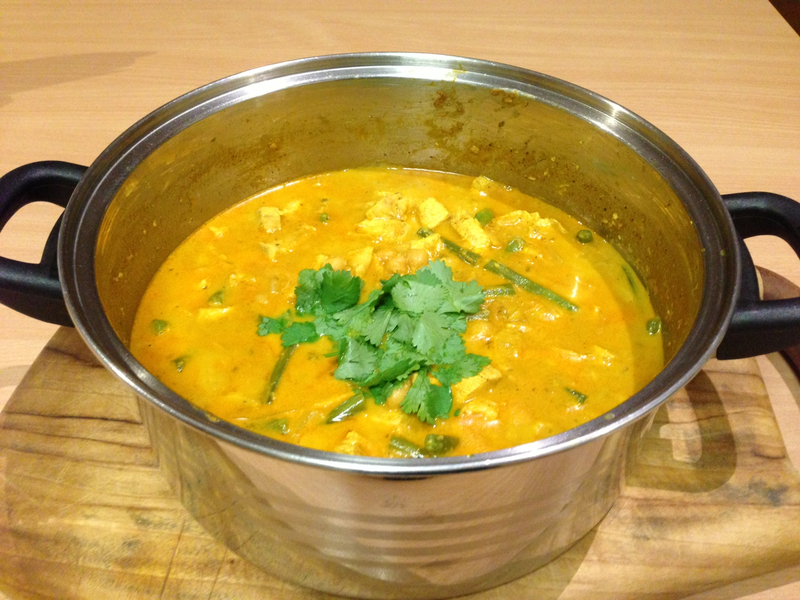 I used tikka masala instead of korma paste and it worked really well. This website was so helpful when I was scouting for recipes that were achievable, as I’m not very experienced at catering for large numbers.